VW Camper? Check. Big Top? Check. Bohemian style? Check. Time to get married! 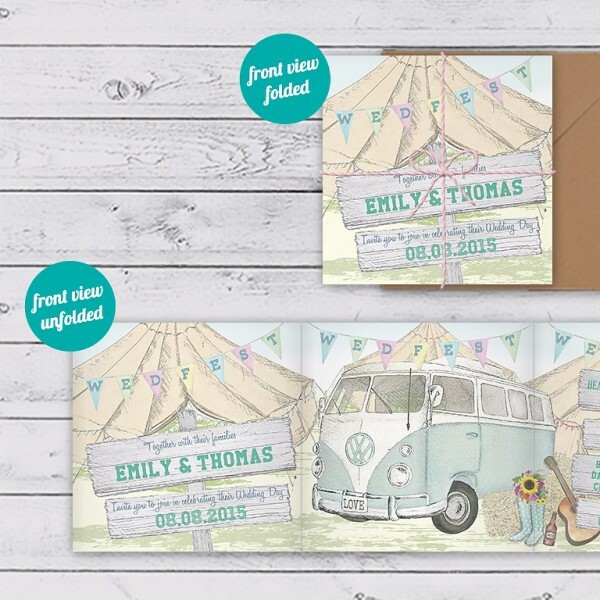 The Wedfest design from Happy Day Design is the epitome of festival or beach inspired weddings, especially with the gorgeous camper van sporting its sweet personalised ‘Love’ number plate. Complete with a guitar, wellies, a bottle of tipple and a length of bunting adorned with the word ‘Wedfest’, it is spot on if you’re wanting to entice and excite your guests ahead of your big day with suggestions of laid back, chilled out summer fun! This design is another of our favourites because it’s not just a pretty illustration… it concertinas into a 121mm square card and is secured by matching baker twine for that extra special finishing touch – such a treat for your guests to untie when they receive their invite in the post! It’s so incredibly easy to personalise, too! To start, you can choose one of three main colours to match your wedding theme; Pastel Pink or Mint for a subtle look or Sunflower Yellow if you’re looking to stand out. After this, you can simply add your own wording to the lovely little wooden sign posts that adorn the front and interior of the invitation, and of course to the extra information on the back, because it’s printed on both sides! Perfect for the bride with its soft colour pallet and length of bunting on the back as an added bonus, it’s also pretty brilliant for the groom, especially if he’s is a lover of VW and has a penchant for beach life and is a bit of a surfer dude. Choose the Wedfest Wedding invitation and the matching Save-the-Date cards to impress your guests with your fresh unrivalled style!